The East Coast Islands are Malaysia Peninsula’s most unspoiled treasures. Boasting idyllic coastlines and crystal clear waters, the islands offer an endless tropical bliss for sun-seekers. Beneath the aquamarine waters of the East Coast Islands lies a fascinating world of corals and marine life that is waiting to be discovered. The compelling beauty of this region enchants with its azure waters. Fringed by white sand, it dazzles against the backdrop of jungle clad hills making for picture-perfect views. The East Coast’s three key regions, Kelantan, Pahang and Terengganu, offer a variety of different activities for visitors both in and out of the water. It offers world-class diving and snorkelling where you can find yourself up close with black-tip shark and hawksbill turtles. Hafiz Hashim, Director of Tourism Malaysia in Auckland, says New Zealanders will be astonished by the untouched beauty of the East Coast Islands. “The East Coast Islands offer unspoiled island retreats where reality can often drift away amongst days of complete relaxation and sun-seeking fun. This relatively undiscovered region of Malaysia is a complete paradise which completely grabs you on arrival and will have you wishing to never leave,” he says. 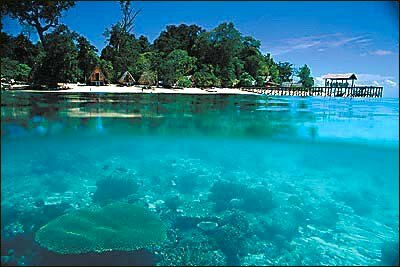 The East Coast of Malaysia is highly seasonal, so the best time to visit the islands is from March to October. Pulau Redang is the largest of the Terengganu islands. The island is famous for its picture perfect views and fabulous dive sights. Sheltered within the Pulau Redang Marine Park, the waters here are rich in marine life, making it the perfect spot for diving. At midday, when sun rays penetrate the sea, brilliant hues of coral, anemones and fish can be seen. To get there just catch a boat at any of the jetties in Kuala Terengganu and Merang. Travelling time to Redang is one hour from Kuala Terengganu and 50 minutes from Merang. In contrast to the neighbouring Perhentian Islands backpacker hangout, Redang has a more upmarket image, as almost all accommodation on the island is resort-based. The largest beach is Pasir Panjang on the east side, featuring half a dozen resorts. The Perhentian Islands are a small group of beautiful, coral-fringed islands not far from the Thai border. Popular among Malaysian and international travellers alike, the Perhentians are surrounded by clear waters rich in marine life making them renowned for great diving and excellent snorkeling. Popular dive sites include the Pinnacle (aka Tokong Laut, “Temple of the Sea”) and the Sugar Wreck, an easily accessible 3500-ton sugar hauler. The Perhentian Islands are also home to a significant green turtle nesting population. Most accommodation can be found on Perhentian Besar, the larger island. Kecil has cheaper accommodation while Besar is a little more expensive and caters more to families and those who want to avoid the backpacker party scene. Access to the Perhentian Islands is by ferry from Kuala Besut, which is usually reached from either Kota Bharu or Kuala Terengganu. Hailed as one of Terengganu’s best kept secrets, Land Tengah is a smaller, more secluded getaway located between the islands of Redang and Perhentian. From the moment you arrive, the magic of Lang Tengah will enchant you –the waters are crystal clear and the views are breathtakingly beautiful. There are only three resorts on the island, giving visitors total relaxation and privacy. The well-sheltered bay at Palau Tenggol is home to mature coral gardens, making it a delight for reef lovers. Being the farthest island from the mainland, the nutrient-rich waters of Tenggol are home to a kaleidoscope of colourful corals and marine life. The island boasts three beach resorts, making it a dream holiday destination. A tiny tropical paradise, Pulau Kapas is home to a variety of both hard and soft corals amongst which reside rich marine life. This island is known for squid fishing at certain times of the year. Pulau Gemia is a privately-owned island with a solitary boutique resort. It is the perfect place for a quiet holiday with activities such as snorkelling, scuba diving, jungle trekking and beach games. The turtle-shaped Pulau Tioman is the largest and most impressive of the east coast islands. The island is an idyllic spot for leisurely days under the sun. The waters around Tioman are ideal for a host of water activities. The clear water is also perfect for exploring and discovering the astounding colours of the marine life that swim playfully in its depths. It is the most developed of the volcanic islands, and offers a sense of peace, tranquillity and simplicity that embraces visitors upon arrival. There are several villages scattered around the coastline, the larger ones being Salang, Tekek, Genting, Paya and Juara. Keen hikers should try the beautiful cross-island hike from the village of Tekek on the west to Juara on the east. It can be done in an easy day and takes in both jungle and beach views of both sides of Tioman.